When Ingrid Archie was six years old, her mother, an alcoholic, attacked her older sister with a knife. The police were called; child services came. It was a rupture that would color her life for the next 28 years. Archie, now 34, wound up in the foster care system, living in a group home where she fell under the negative influence of the other residents. “I started hanging out with them,” Archie said. She began ditching school, stealing from her foster families, and running away. At age 18, she had her first daughter and her first conviction for selling drugs. She was hanging with gang members, one of whom stayed at her apartment and kept drugs there. She was already on probation when the police swept through and charged her with her first felony — gang affiliation and drug possession – which landed her in state prison at age 21. Archie served three years. Her daughter was placed with her sister. Once released, she moved into a residential treatment facility in Los Angeles and worked two jobs while studying psychology at East LA College. By 2009 her employer, a telecommunications company, laid her off after changing its hiring policy to exclude hiring people convicted of a felony. 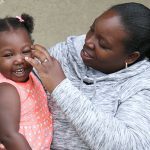 By 2013 she was still struggling to land steady work, not only were employers turning her away because of her record, but having a felony also meant she could not qualify for childcare assistance for her children (she had her second daughter during this time). Suffering from post-partum depression and barely making ends meet on $300 a month, she went to the store to buy milk and diapers. She took one daughter in with her, but left her other daughter in the car. Police officers were waiting for her in the parking lot when she returned. She was charged with child endangerment. She maintains she had been in the store for five minutes. That charge, combined with her past record landed her in prison for another three years. While in prison, she learned about Prop. 47. She noticed that other inmates were filling out paperwork to get their sentences reduced. Educating herself on the law, she petitioned court officials in Lancaster for a sentence reduction of her commercial burglary charge, which was approved. Once she gets off probation, she’ll petition to make the change official on her record. Being behind bars was hard, but Archie is quick to point out that the toughest part was realizing that, if she had not come across the right information at the right time, her chance to pursue her own freedom might have fallen through the cracks. That’s why she’s so committed to doing what she can to educate people about Prop. 47. Most recently she created a public service announcement for PADNET, Long Beach’s Community Media Center and public access TV station. Today Archie has regained custody of her daughters, now 14 and 3, and is the new Prop 47 Specialist at the New Way of Life helping others on their path to a second chance.